Click here to visit their site and click “Register” towards the bottom. Then fill out the easy form to enter their sweepstakes. They’re giving away over 200 free cooking related prizes. Winners will be notified via email around June 16th. Good luck! 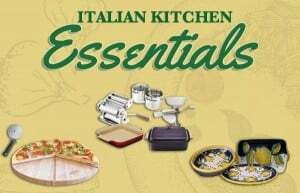 Three (3) Grand Prizes: Complete Italian Cooking set. Five (5) First Prizes: Rustic serving dish set. Twenty (20) Second Prizes: Pizza board with custom Il Villaggio logo. Fifty (50) Third Prizes: Boska 2 piece cheese slicer/grater. Sixty (60) Special Rewards: Essentials of Classic Italian Cooking book. One hundred (100) Runner-up Prizes: Garlic press.